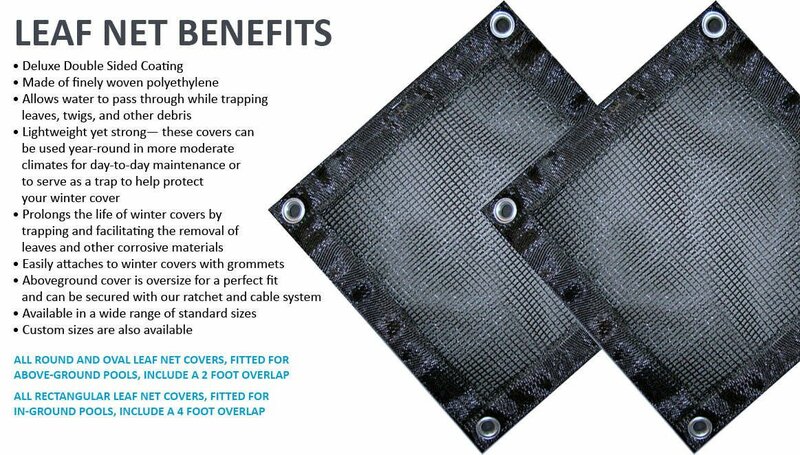 A great addition to your winter cover, the Leaf Net cover keeps leaves and debris out of your pool. The Leaf Net’s fine mesh traps the leaves and removes them from your pool so spring clean-up is a snap. If you live in an area with a lot of leaves, try the Leaf Net! Tired of removing heavy, smelly and decaying leaves from your pool cover each spring? A leaf net is the answer. Simply lay the leaf net on top of your winter cover before the leaves fall, and afterwards simply pull it off of the top of the pool cover. No more dredging leaves, sticks and acorns from your pool cover. Spring clean up of your pool cover is much easier, as all debris comes off of your pool cover in one simple motion.